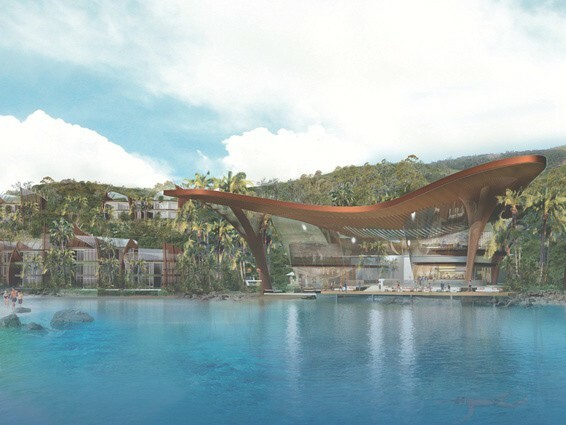 A planned $583-million resort development in the Whitsundays has attracted the outrage of locals, with a community opposition group calling the proposal a “land grab”. The Lindeman Great Barrier Reef Resort project would see nearly 37 hectares of land in the Whitsunday Islands privatised. The land, which is currently a national park, would be used for the creation of four new resort precincts, a village dedicated to retail and hospitality, a golf course, a “glamping” area, and an updated airstrip. The land in question was purchased for $12 million in 2012 by White Horse, a development company owned by China-based media mogul William Han. Formerly the location of Lindeman Island’s Club Med resort, the previous structure was heavily damaged by Cyclone Yasi, ultimately leading to its closure in January 2012. White Horse’s proposed $583-million masterplan would see an extensive renovation and upgrade of the previous resort, to be led by DBI Architects. A local community group has expressed outrage at the Lindeman Great Barrier Reef Resort proposal, calling it a “land grab”. They say that the plans represent “yet another attempt by private interests to erode the values of our national parks”. The Mackay Conservation Group has launched a petition in an attempt to block the government’s approval of the project. The petition calls on Queensland premier, Annastacia Palaszczuk, and national parks minister, Steven Miles, to recognise the importance of protecting land belonging to the national park. So far, the state government has seemed to express support for the Lindeman Island Resort redevelopment. They have justified the concession of national park land by pointing to the jobs that would be created by such a large-scale construction project. State development minister, Anthony Lynham, also says that the development is consistent with government tourism plans put in place for the area. Lynham additionally claims the resort would respect the ecology of the World Heritage-listed setting of the Great Barrier Reef. A draft environmental impact statement (EIS) for the Lindeman Great Barrier Reef Resort project was made publicly available on 22 July. The EIS, developed by DBI Design, states that resort would “respect” and “improve” the national park setting, and that the heights of all proposed buildings would be similar to or lower than existing buildings on Lindeman Island. Comments on the draft EIS will be accepted until 4 September 2017. The full document can be viewed here.